Before the huge road and river flood wall was built Guide Street was at the waterfront. It was one of the wealthiest streets in Taipei with many rich merchant families living here. Like Gulangyu Island in Xiamen, China, it was the street where foreigners were permitted residence. Above is a satellite photo from 1945 showing the Dadaocheng area. The wide yellow line on the riverfront is where Huanhe Road is now. Guide Street is the narrow street next to this. To the left of each piece of text is a surviving mansion. As you can see from above, not a lot of Guide Street is left now (though Dihua Street has fared much better). The widening of Xining N Road destroyed a lot, and changing fortunes in the area led to the rest being replaced with taller housing. If you start at the southern end of Guide, the first mansion you come to (number 49) is a very imposing and dour looking building. Like many old houses in the area it's built on raised steps for protection in high tides and floods. 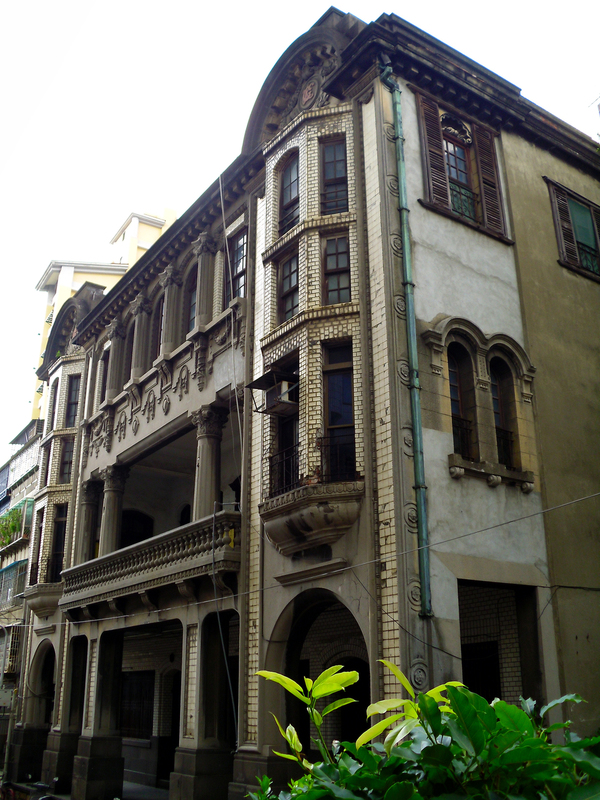 The Xining Rd side of this structure appears to be a tea shop, one of many remaining in what was Taipei's tea district. The entire complex suffered a huge fire last year, but it seems to have been restored (pic is Jan 2015). The smaller building next to it is a very early structure from the Qing dynasty. I've never seen any other buildings here with bamboo shaped drainpipes, (as much is made of Taipei 101's bamboo influences I'm going to assume bamboo is used auspiciously here), and it's simple style suggests it predates most of the other buildings in this area. The small red building with blocked in windows on the river side of the street is the Li Chun Sheng memorial church. I've seen the interior of this building and it is very white and bland. It was a post office before it became a church in 1937, which explains it's not very church-ish appearance. The second mansion on Guide is very beautiful and grand. The Chen Tian Lai house was built in 1920 by a wealthy tea merchant. It shows a mix of eastern and western influences; the sort of fusion of styles that can often be found around major Asian trading ports. Sadly it's private and there's no public entry, but it's worth a look for an idea of just how opulent the area once was. Follow the street to the end, then make two right turns to go down Xining N road. Across the street is the building housing the Lin Puppet Museum. It's not really a mansion but the townhouse is very grand. The Lin Puppet Museum is the building covered in vegetation. I was more interested than I thought I'd be in the puppet museum. There is a lot more variety than I expected in the puppetry world including some fairly creepy messenger from hell puppets. A few exhibits are aimed squarely at children, it is a puppet museum after all, but they are still interesting. The fourth floor contains a fun 'journey through hell' which conveys some of the complexity of Buddhist hell. If you need to scare the kids into behaving this would probably work quite well. One of the many punishments in Hell. Behind the Lin mansion is another large townhouse, and at the end of the street is Dihua and the City God Temple. Head north up Xining, cross over Minsheng and go past the small park. Lane 308 Guisui Street is across the road. Hidden away past some run down Qing era homes is the Koo family mansion. The Qing Chinese troops still in Taiwan, rallied behind this new state against the Japanese. However Ruifang and Keelung were captured, and the leaders of the new republic fled. Left with no leader and no pay, the Chinese troops began to ransack Taipei. Koo Xian-Rong or Koo Hsien-Jung, depending on what pinyin is used, sent an envoy to invite the Japanese into Taipei and quell the rioting. The Japanese took Taipei with ease and most of the Chinese troops surrendered. The Koo family was granted a monopoly on salt as a reward for their actions. They became incredibly wealthy, and Koo Xian-Rong's son built the family mansion here. They also built a large mansion in Lugang, and the Koo family remain powerful in Taiwanese business circles and politics. I wonder how Koo senior is thought of among Taiwanese. I imagine some view him as a traitor (although the Republic of Formosa was intended to be little more than a vassal state to China), some maybe admire his efforts to stop the rioting, but many probably have no idea who he is. There are some more large mansions in Dadaocheng, but they are more scattered and often not as grand. You can find a few more on the Hidden Taiwan Map.